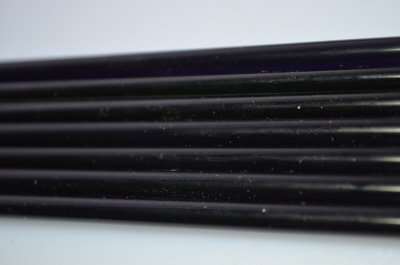 This is a 125grm pack of Reichenbach 94coe glass rods, Dark Transparent in colour these are mixed colours and will be a selection od Heliotrope, Dark Gold Ruby, Fuschia, Hyacinth, Amethyst, Wine Red & Violet x 7 rods approx, 5mm dia at 330mm long. These are intense saturated colours and go a long way. From time to time we have Vetrofond, Effetre, CiM and Reichenbach glass packs that because of "Trade In" , "Studio Buy Outs" or "Bulk Purchase" we can offer these at massively reduced prices for odd size packs so we are listing them here. These rods are all new.